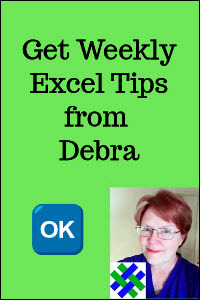 Just click a button on the FastExcel ribbon, to quickly analyze a workbook. It will find and prioritise the calculation bottlenecks, showing you the worst worksheets and ranges. Next, use FastExcel's advanced functions and built-in Help for advice on getting rid of those problems, or speeding them up. You can see those steps in this short video, which shows FastExcel version 3. I received a copy of FastExcel V3, and spent some time using the different tools in the package. This will help you decide if the product will be helpful to you, in the work that you're doing in Excel. 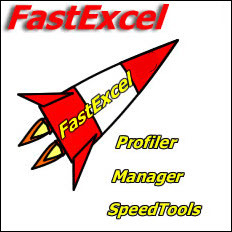 I found that FastExcel is a very powerful tool, and I recommend it if you need help with speeding up your files. The Profiler is the key to pinpointing the problems areas in a file, and the other products will help solve the speed problems, and manage your workbooks. FastExcel is a complex package, and you will have to invest some time in familiarizing yourself with the tools, and figuring out the best solution in different workbooks. However, you will find that your investment quickly pays off, in time saved in troubleshooting, and reduced calculation times. FastExcel is not for everyone though -- if you only create simple Excel files, and don't have problems with calculation speed, then you don't need this add-in. However, if you are struggling with big and slow Excel files, FastExcel is a great investment. Do any of these problems sound familiar? Are your workbooks suffering from file bloat? Are your lookups or array formulae running slow? Are your UDFs slowing things down? Are you using multi-threading efficiently? Have you got a formulae blockage? Have you got a memory usage problem? How much time are each of these problems taking? Unless you're a calculation expert, you might not even know what some of those questions mean, and that can make it hard to pinpoint the problems. Most slow-running Excel files contain a few problem areas, or bottlenecks. In large workbooks it can be hard to find and prioritise those bottlenecks. Instead of searching on your own, use the timing and profiling tools in FastExcel to rapidly drill down, locate and prioritise these bottlenecks, and then use FastExcel's advanced functions and built-in Help for advice on eliminating or optimising them. Drill down and locate your memory and calculation bottlenecks. Prioritise bottlenecks by time consumption. Solve calculation and memory problems. Document and compare calculation efficiency and memory usage. Time your User Defined Functions. The Profiler has tools that help you find and prioritize any calculation bottlenecks in a workbook. If you're tired of waiting for Excel to calculate, the Profiler tools can help you identify the reasons for the slow calculation. FastExcel Manager has tools to help you build, debug and maintain your Excel workbooks. Sheet Manager - Easily manage and manipulate worksheets. 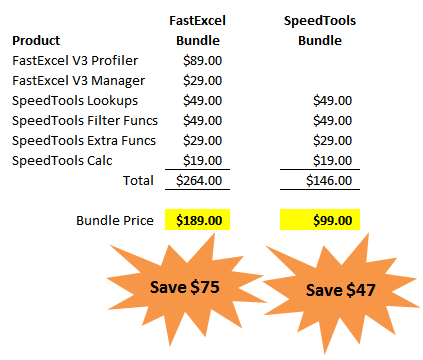 The SpeedTools product has tools and functions to help you speed up your Excel calculations. It has four components that you can buy separately, or as a bundle. SpeedTools Calc: set Excel to only calculate what you need. NOTE: This component is automatically included if you purchase any of the other SpeedTools components. SpeedTools Filters: functions to help you with high-performance dynamic sorting, distinct/uniques and multiple-condition filtering and aggregating. Here is a screen shot of the Calculation Control, in the SpeedTools bundle. After I downloaded and installed my copy of the FastExcel B3 bundle, I opened the User Guide, a PDF file, to see how to get started. The User Guide is huge -- 302 pages -- with a long and detailed table of contents at the front of the guide. Unfortunately, the page numbers aren't clickable, but you can type the page number into the box at the top of Adobe Reader, to quickly go to a page. NOTE: There isn't an index at the end of the guide, but you can press Ctrl + F in Adobe Reader, to find a specific topic. I skimmed through the introduction, and then began to work through the Quick Start Guide. This section covers the features of the FastExcel Profiler, and begins with some questions on why your spreadsheet might be slow. The next section explains the difference between recalculation and full calculation in Excel -- an important concept if you're going to fix the problems in your workbooks. The guide explains two calculation scenarios, and advises you to identify which one is similar to your workbook setup. Then, the multi-threaded calculation feature is mentioned -- it can dramatically improve your calculations times, but some functions aren't capable of using this feature. FastExcel can identify those for you. Next, there are step-by-step instructions for using the DrillDown tool, to find calculation bottlenecks in your workbook. Step 1 is to make a backup of your workbook before you start -- good advice! 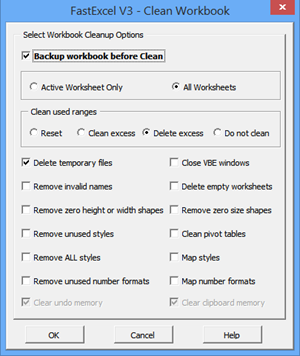 Then, clean your workbook with the Clean Workbook command, to get rid of unnecessary items and wasted space. That tool is in the FastExcel Manager section of the Ribbon (and named Cleaner), so I guess you'll have to skip that step if you didn't buy the whole bundle! A nice feature of the Cleaner is that you can check a box so FastExcel will automatically create a backup copy of your file, before it cleans the file. That should be mentioned in the instructions, to save you the extra step of manually doing the backup. You can also check the boxes for the types of things you would like cleaned in your file, such as unused styles and empty worksheets. Click OK, and a message appears, warning that the Clean operation cannot be undone. It lists all the options that you selected, so click OK if you're sure that you want to go ahead. You might see other confirmation messages, depending on the options that you selected. Then, a final message appears, to let you know that the Cleaner has finished the job. Step 2 is to use the DrillDown command, to create a profile for the active workbook. After you click the DrillDown command, a few confirmation messages will appear, and then a new workbook is created, with the Profile for the workbook. The Profile is a bit overwhelming when you first see it, and I wasn't sure where to look first. There is information about my computer, the workbook, calculation settings, and the worksheets. The colours are not what I'd pick, but that's a minor complaint. Fortunately, there are lots of comments on the sheet, so you can point to a cell, and get more information about what is in that column. Also, a few cells are highlighted in orange, so you can investigate those sections, to see what the problem is. For me, the key information was the list of worksheets, which are listed from worst to best, based on calculation time. That showed me where the biggest problems were. Step 3 shows you how to use the DrillDown command again, to analyze the worst worksheet. Select that sheet name in the list, then click the DrillDown command again, to see the Profile for the selected worksheet. I selected the Count_Uniques sheet name, and it showed me the worst areas on that sheet. Cell D11 was listed first in the sheet that was profiled, and that single cell was taking 98.6% of the sheet's calculation time! Step 4 shows you how to use the DrillDown command another time, to create a profile for the worst area of the worst worksheet. 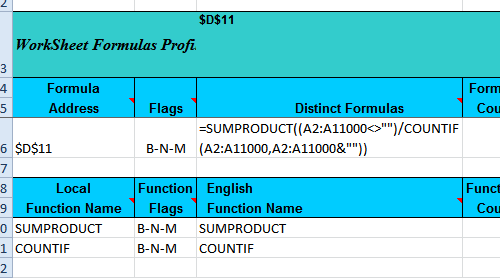 You can see the formula that is in the range, and information about the functions in the formula. The instructions in Step 5 tell you to repeat steps 3 and 4 for the second worst worksheet and area. You can continue to do this, until you find a few key trouble areas that you want to focus on. So, the DrillDown tool had given me some areas to investigate, but I wasn't sure what to do next! So I moved on to the next section in the user guide. This section lists some of the common bottlenecks, such as conditional formats, volatile functions and array formulas. In the file that I was profiling, cell D11 was the worst area on the worst sheet, so I selected it, to see if it had any of the common bottlenecks. And it did -- the cell had a SUMPRODUCT function, and that is in the list. The next section explains how to use FastExcel to eliminate those bottlenecks, after you have identified them. There are alternatives suggested, and I could use one of the SpeedTools functions, instead of SUMPRODUCT, to improve the speed. 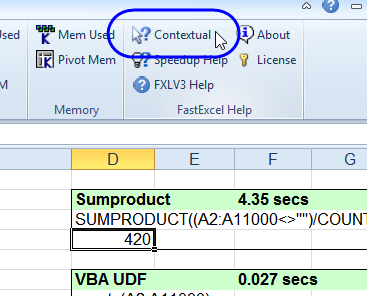 You can go to the reference guide in the User Guide, for detailed instructions, or click the Help button in FastExcel. After that, there were instructions for using FastExcel to help you reduce or remove the bottlenecks, by using the built-in FastExcel Help. For example, after you locate a problem cell, select that cell, and click on the Contextual Help button on the Ribbon. The FastExcel Help opens, with tips for improving the formula. For example, I could use some of the SpeedTools functions, as a replacement for the SUMPRODUCT and COUNTIF functions. NOTE: Those functions only work if you have the SpeedTools installed, so only use these functions in files that you just use yourself, or share with other people who also have SpeedTools installed. You can buy individual licences for FastExcel V3 products, or save money by purchasing a bundle of licences.